Default Title - £ 5.00 GBP Only 5 left! If you bought a servo from us you probably got a bunch of plastic add-ons that you can snap onto the rotating part of the servo. These are called 'servo horns' and the standard ones you'll get are plastic pieces. They're good but often short and not very strong plastic. This Machined Aluminum Servo Arm lets you bring your A-Game to servo projects. It's strong anodized aluminum. Looks great, is easy to install and will last for a long time. The servo arm is 37mm long and the arm part is 2.5mm thick aluminum. It has four tapped 2mm screw holes. The holes are 15mm, 20mm, 25mm and 30mm from the center rotational point. But it will not fit neither the Parallax Feedback 360 Degree High Speed Continuous Rotation Servo nor micro and sub-micro servos. 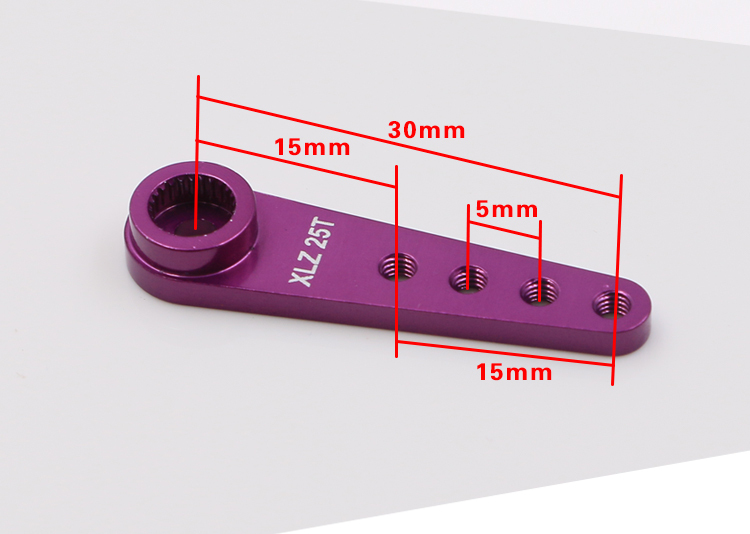 Product Dimensions: 37.0mm x 6.0mm x 5.0mm / 1.5" x 0.2" x 0.2"